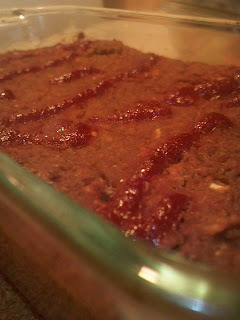 Meatloaf, smeatloaf, double beatloaf, I actually like this un-meatloaf. For vegan option, soak 1 Tbsp. ground flax in 3 Tbsp. water for 2 minutes and substitute for the egg. Combine all but the onion and tomato in a food processor. Pulse 7- 10 times, or until about 3/4 of the lentils and bread are coarsely copped up. The mixture won't combine completely, but that's okay. Scrape the mixture into a large mixing bowl and add the tomatoes and onions. The Spike is pretty salty, but you should taste the mix to see if you want to add more salt.Grease a loaf pan with about 1/2 tsp. of olive Oil. Pour the mixture into the pan and smooth with a spatula. If you want, you can make a fun little ketchup design on top. Bake at 350 or until browned on top.